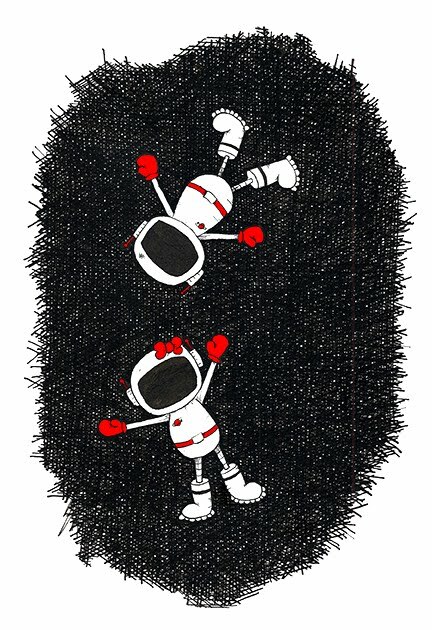 WHAT: The Toys Are Tools Best Books List 2013 is HERE! I am not sure if I am dyslexic but it should be said right now that I'm not big on reading. I have two children and one of them is not big on reading either. But guess what, they both love stories. This year, thanks to a special educator/mom to a dyslexic child, I heard about Learning Ally and it has rocked our world. Learning Ally used to be called The Library for the Blind and Dyslexic. I am not sure when they changed their name but they are my ally for sure. This is the way that my son can "read" books that interest him because there is pretty much no such thing as a "High Interest-Low Level" book (I hate that term). Maybe a book of poems could work but that's about it. Seriously, it's the best thing ever. 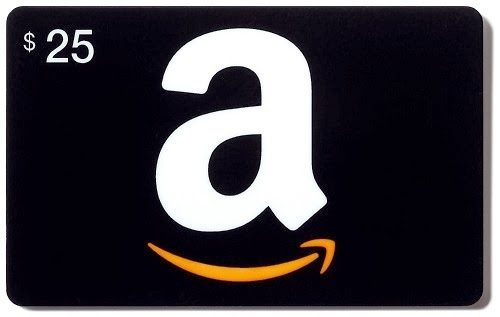 A year's membership costs about as much as three audiobooks on Amazon. That's crazy but crazy can save lives. It's practically free as far as I'm concerned. He is listening to a book while reading text and trying to spot new words and writing them down with his ARK pencil. Only, if you mean it, please tell my son that he looks super cool! He looks like a warrior to me here. p.s. screen colors, fonts, are all adjustable but not every book has accompanying text displayed. Learning Ally should really be called "Keys to a Bigger Better World" because my child fell in love with Harry Potter this year. He listened to all the books and then he watched all the movies. It used to be part of his bedtime routine until it he became just more and more riveted and then we had to put a stop to that. But seriously, one could have worse "problems." Having said that I wanted to share with you a list of books that can be enjoyed by all. Since I don't review books as much as I review toys, I am going to say that these are my "Favorites" (The "Best" in the title is just for the search engines.. please forgive) Also, rather than following age recommendations, I highly suggest you look at the photos on this post and also on the links for purchase. The first birds-and-the-bees-talk I had with #1 was pathetic. I ended up going to YouTube and showing him something that you might see on NOVA. Still, there wasn't a permanent L on my forehead because this is a talk that we will have again and again. I've done at least two do-overs this year. This is why I like Little Red Writing. When it's in a book, you can read it over and over again and have a new discussion each time. It's like building blocks. And I must applaud To me, when someone talks to me about my writing, especially if they are trying to be helpful, I can literally feel my heart shriveling up. It's almost painful. This is because writing is an expression of what is inside of you. If it is not good enough then you feel you are not good enough. So imagine how a kid feels. My son's tutor taught him these words. They are literally "writing tools." Kids must feel like this. Remember I talked about "mental file cabinets"? How many books have you read for younger elementary children about writing- the emotional side of it? Zero? Me too! For sure, these two women are brave for even TOUCHING this topic because for some kids writing is the ULTIMATE turn-off and I know that because I'm living it right now. Never mind that my job is writing and it kills me to that my kid doesn't enjoy it. And yet, because this family knows Melissa Sweet's style of illustration, there is no turn-off, rather there is interest. Using a book to talk about fears with a child is not new (new baby brother, potty, first day of school) but writing...? I think this is especially difficult. 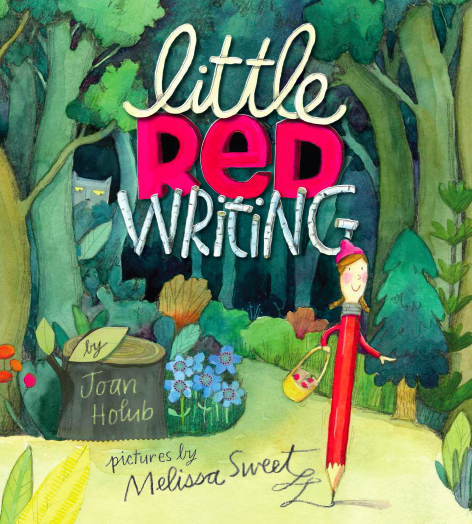 But Joan Holub and Melissa Sweet know what they're doing. They used a familiar theme, excellent graphics, and words that kids have heard in school. It's so smart. If you are concerned about executive functioning, think about the potential of this book to help you talk about things like focus, staying motivated, and even regulating emotions - things that one must do during writing. 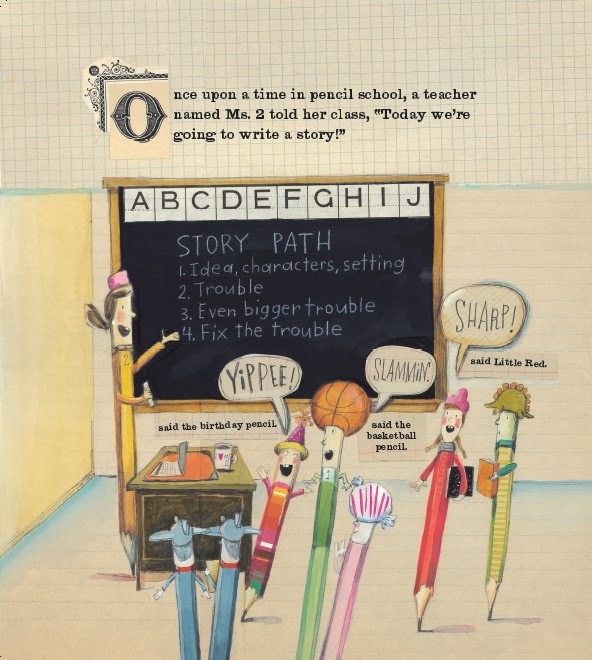 If you have a child who loves to write or even hates to write, this book is for you! 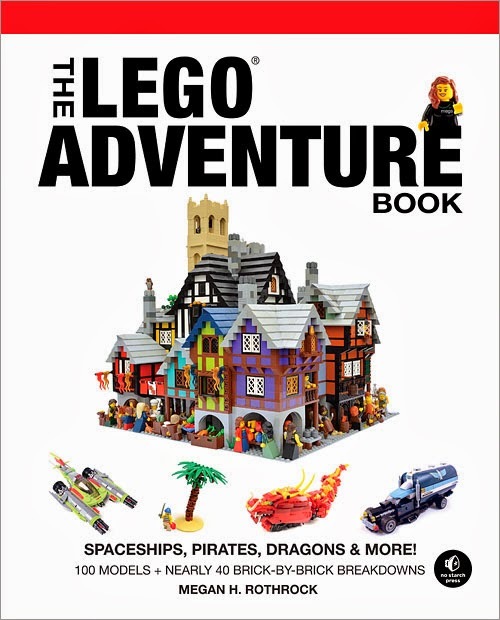 I loved Megan Rothrock's first LEGO book: The LEGO Adventure Book- Book 2. It was fun to look at all the amazing things she could build. I loved how she featured the work of builders from around the world. This year, there are even more instructions and even more impressive builds that center around the theme of dragons, pirates, and spaceships but I just love how this appears to have more animation and more story with a dialogue that even grown-ups will appreciate. I can't stress enough the instructional piece here. 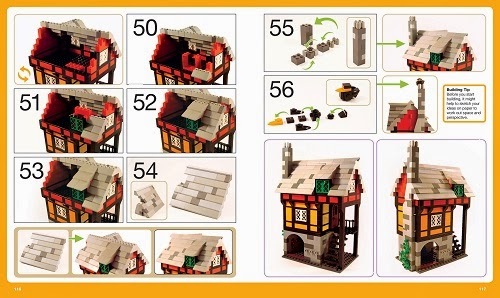 While I like the idea of deconstructing something with your mind to build it, for those of us who prefer it, you can use the many instructions to go step by step from building anything as simple as a water fountain to building a gas station. 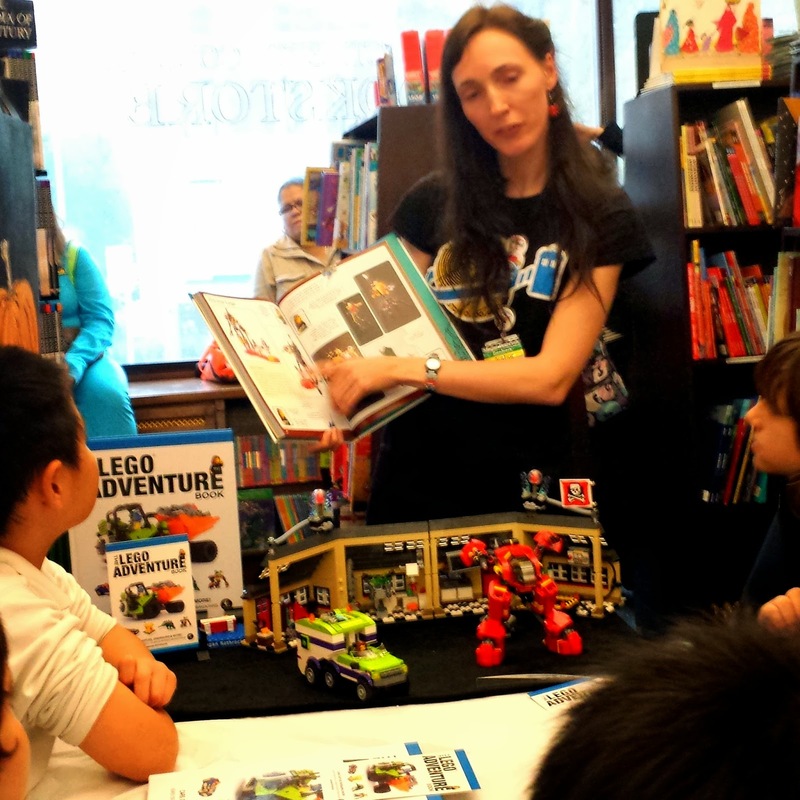 My children had the pleasure of meeting Megs and Brickbot. Pictured is Megan Rothrock holding her book and #1 in white on the left. This was the only millisecond his hands weren't all over that red robot. It's a storybook too. It's an adventure, remember? It's not an instruction manual with talk bubbles. Read about why I like O'Reilly as my affiliate- you can share your e-books. I have found rock-solid proof that comic books competently teach science! Don't agree? Well, think like this... who was the best teacher that you ever had? Did he make you laugh? Do you still remember what he taught you? 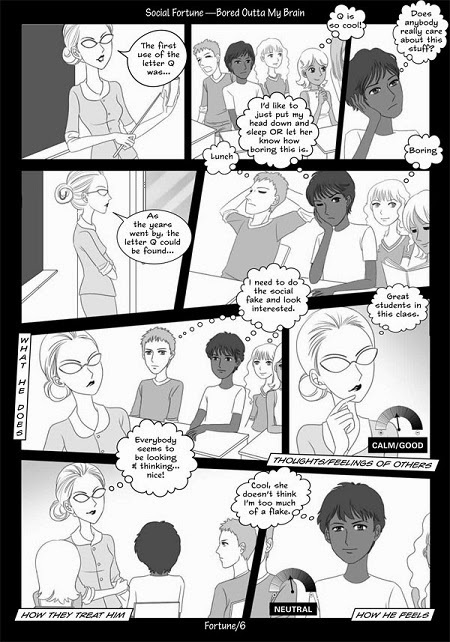 What about the most boring teacher, the one whose face you can't even remember? Okay, 'nuff said. This book uses great humor and great graphics to get its point across. Apparently their point has gotten across to 20 million people so far and guess what? This is the first time it's being printed in English. So be the leader of your crowd so that you can be one of the first of the million of English speakers reading this book. Since my son has read more of this book than I have, I asked him for his opinion last night as he was reading the book. Me: Hey Buddy, how do like this book? Me: Hello? How do you like this book? Is it funny? I think that means he likes the book a lot. Oh, and additional insight just for you: I was born in Korea and I've read a lot of Korean comic books! You should know that Koreans have been using cartoons for a while now to teach things. I still have my copies of two comic books that teach proverbs which is an important part of the language arts curriculum in Korea. From an old Korean comic book I have. This is a proverb that highlights the importance of restricting (ie. grounding) yourself after you've done wrong. Here this boy went too far and felt unworthy to sleep in his own room. I can't stress enough how fascinating these 3 books are. 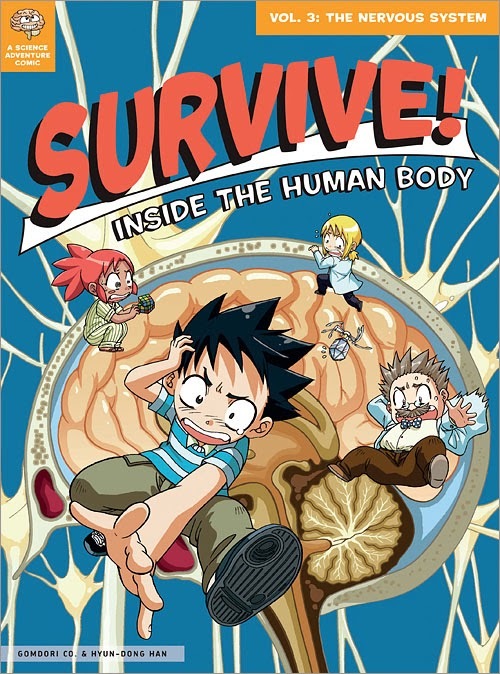 They basically show you the inside of the body as two characters were miniaturized and eaten by a friend (long story). 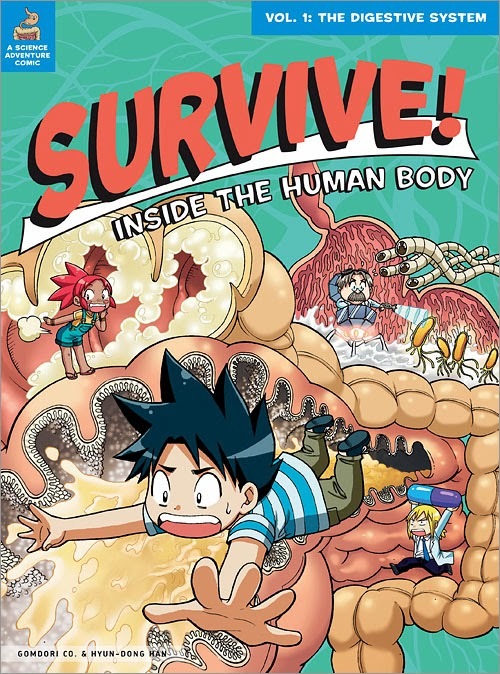 This book is so informative and has a clever way of dealing with things that could be kinda gross to discuss. More importantly, it does a masterful job at taking the reader for a journey. Thus, it's not a lesson. It's an experience and to me, that's an effective way to learn anything! Read about why I like O Reilly as my affiliate - you can share your e-books. Favorite Books for Dirt Diggers, Pokemon Lovers, and Children Who May Think That Social Studies is Boring- GASP! I am very much like #1 this way. When I was little, I loved non-fiction books. I still do. Non-fiction books are easier for me to read. I think the information is just so well-organized that I don't feel overwhelmed by it. However, this book, The Elements is WAY beyond well-organized. 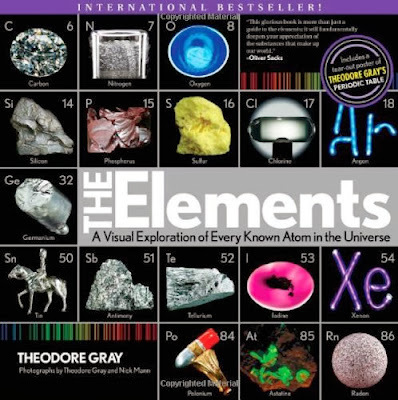 Oh no, this book takes the Periodic Table of Elements and turns them into ART. Q: Tungsten is used as fishing sinkers or ear weights for dogs or both or none of the above? I don't think kids will really be held responsible for knowing this table until high school but hey, why wait? It's sooooo much better to allow them to just wonder about this now. 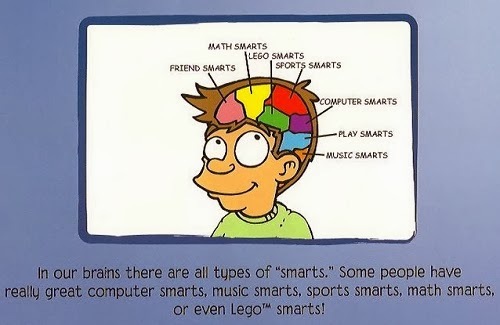 Learn bits of information FOR FUN. No tests. No memorizing. No prizes for good grades. Learning is fun because this stuff is damn interesting and if you don't think so then you can at least enjoy looking at these AMAZING photos. I would like to know..... if these photographers can make tungsten look cool, what can they do for me? Exclusive Sale for TAT readers! use TOYSARETOOLS to get 25% off. Not sure when it expires... hopefully never but grab them while supplies last. I haven't talked a lot about design in this section but these books are a great example of how design can motivate an individual. In the case of these story cards from Gryphon, you're not only getting a great graphics but you are also getting a wonderful tactile experience. These cards are soooooo smooth. It feels good just to hold them. To be sure, the artwork is still the best part of these cards. They show you so many pictures of wonderful things happening that spark attention and inquiry. It's hard not to wonder what is happening. 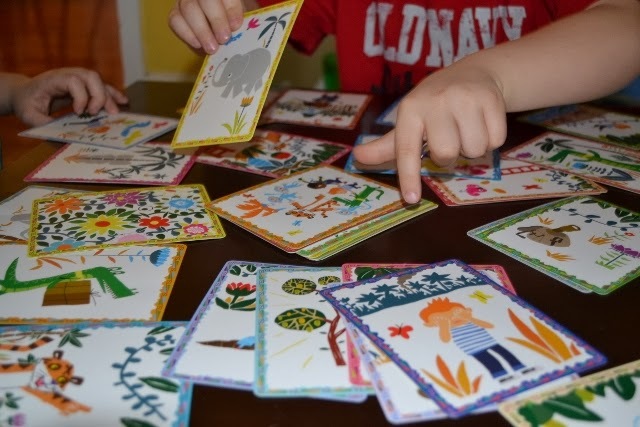 You can make up a sequence or you can do what we do, pick cards randomly and challenge ourselves to make a connection that makes sense (and is entertaining). 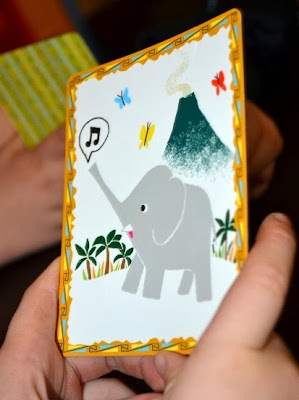 It's not easy to do but good design can motivate even the youngest of children. 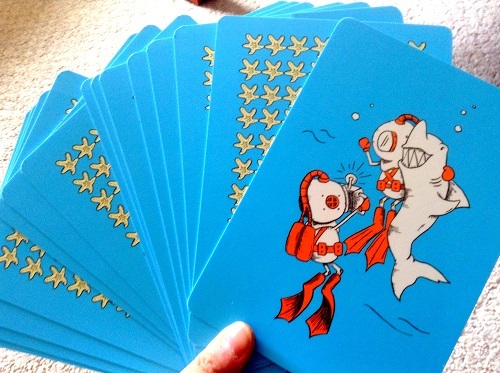 There are so many cards in a deck but the pictures are so awesome, you can make one or fifteen sentences about each picture. 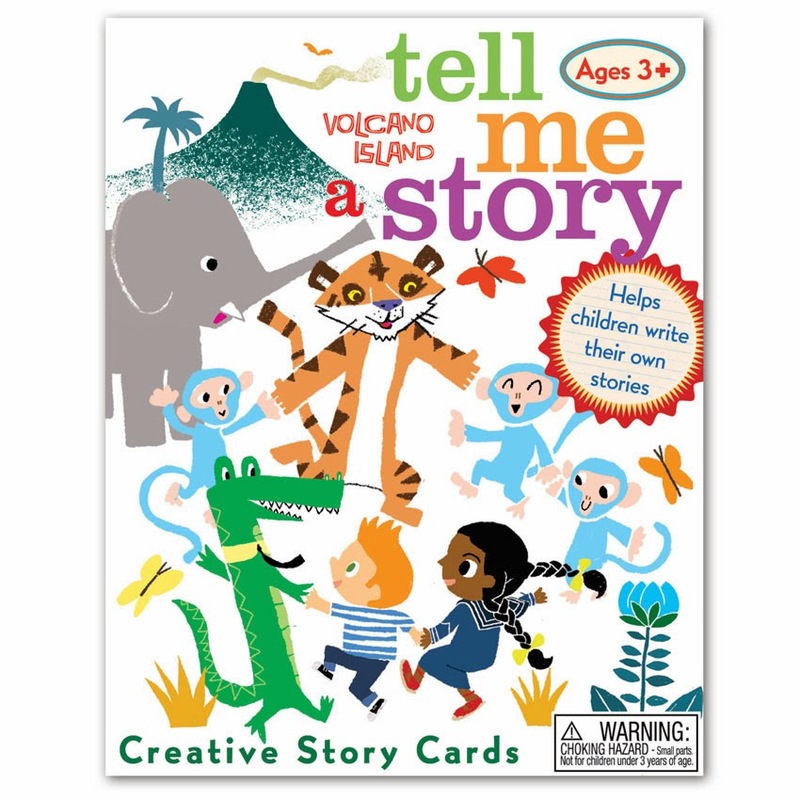 As veteran learning specialist at Friends Seminary, Susan Schwartz told me for my review of these cards, "There are secondary characters,"she said noting that there were obvious characters in the story and that their sizes changed at times. Sometimes the characters were the same size. "That really allows the story teller to be so creative." See full review here. But for kids who have all the words in their throat but can't spit them out in the fashion that describes the picture inside their minds, then they need to loosen up a bit. But DO NOT give them wine, please! Rather, just tickle their funny bone. 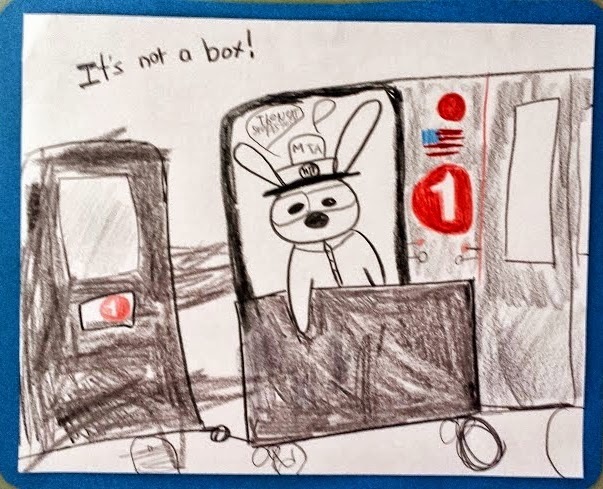 Open the box of forty picture cards that come in one of eeBoo's Tell Me A Story products and you'll see, some of them will really make you chuckle. It's not distractingly funny which is good. Sometimes a chuckle is all you need to slow children down, have them take a deep breath and explain how they see the cards. 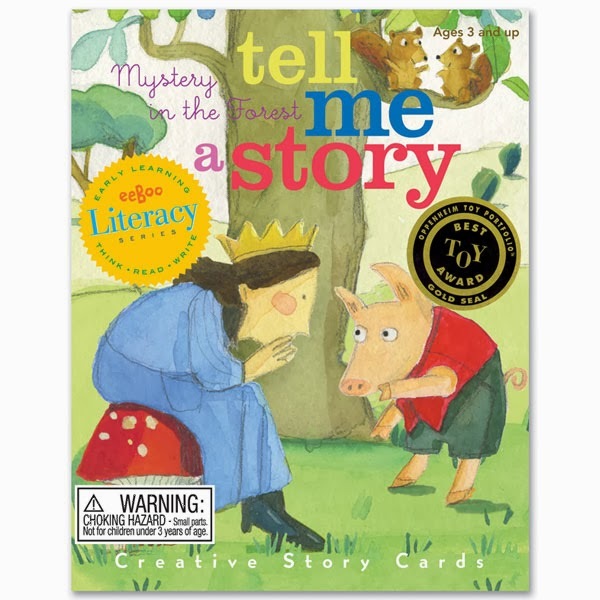 Truth be told, no tool is going to get kids to be master storytellers in an instant but if you seek something that can be used over and over again, these boxes of images are going to provide the kind of variety, stimulation, and inspiration that a kid can use when sharpening his storytelling skills. Let it be said now that you will be totally stunned when you open your book. 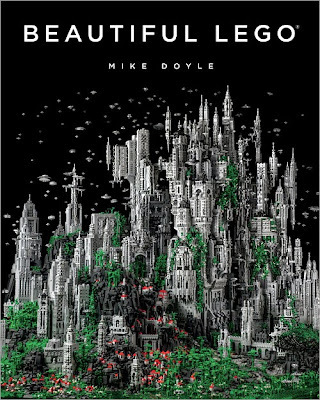 It's inspiring, it's jaw-dropping artwork and the amazing part about this is that this book really measures up to the name, "Beautiful" It features the work of Mike Doyle and countless other artists including Nathan Sawaya. Oh, and don't let the cover fool you. 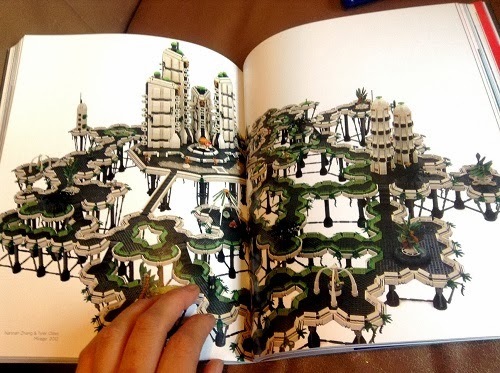 Beautiful LEGO includes sculptures that look absolutely wild but also have many things that look VERY do-able. It's one of those books that you'll never ever give away. Here's one reason I won't give them away. 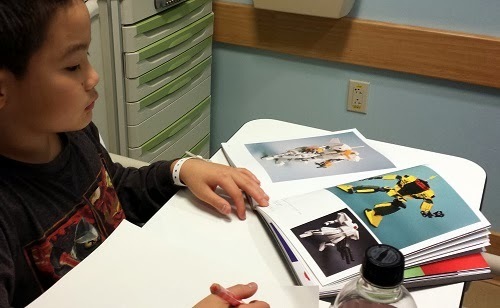 At a recent trip to a pediatric ER, I asked the staff for games since #1 had a mild concussion and so video games (not his, the hospital's) were out of the question. I asked for other games and all they said they had was Candyland. While it didn't last forever, guess what he was able to sink his unfocused teeth into... Beautiful LEGO, of course. It's the perfect book for hospitals! They are like food for children's eyes. Read about why I like O'Reilly as my affiliate. $4 average price for a book. I don't care what anyone says. Junie B. Jones has ADHD and I love her for that. She clearly has executive functioning issues and she needs to work on it. But she is so loveable that usually, she always meet some very special people along the way. What I like about these special people is that they reflect out-of-the-box thinking approach to working with children. 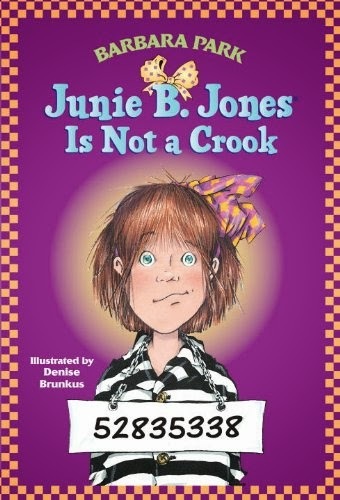 It's quite apparent to me that Junie B. Jones will grow up to be a great disruptive thinker herself who will never accept the answer, "Because that's the way everybody does it." Not every kid can see a rectangle and imagine it is a TV. Not every kid can see a circle and quickly say, "The sun is also a circle." And you know what? My thinking is... if you can kid CAN do those things, then don't rest on that. Challenge him to so much more than the suns, wheels, TVs, etc... If you want some help, I suggest you get not a textbook but rather a very very very simple book with clear lines, clear meaning, and unclear possibilities. That's what you'll get with Not A Box. I bought my copy at a Social Thinking Conference in New York. I gather that these leaders in social communication think this book is very valuable and I couldn't agree more. I used this with my own child and I can tell you, that it's not easy to be creative which makes this book all the more valuable! 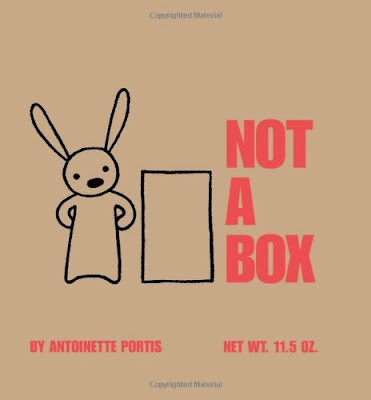 Use this book to jumpstart imaginations and to hear more words like, "It's NOT NOT NOT a BOX!!!" I drew the outline and he "filled in the blanks." Everywhere I go, I talk about Social Thinking. I am a convert. Actually, I'm not a convert because before then I don't even think I was even aware that this was an issue that could be addressed. But for those kids, many of whom who are bright but have "some social issues" we are at a loss. We don't have the tools to teach kids how to be a good social communicator. But kids do learn. They learn when they are shunned by peers. They learn when they are reprimanded by adults. 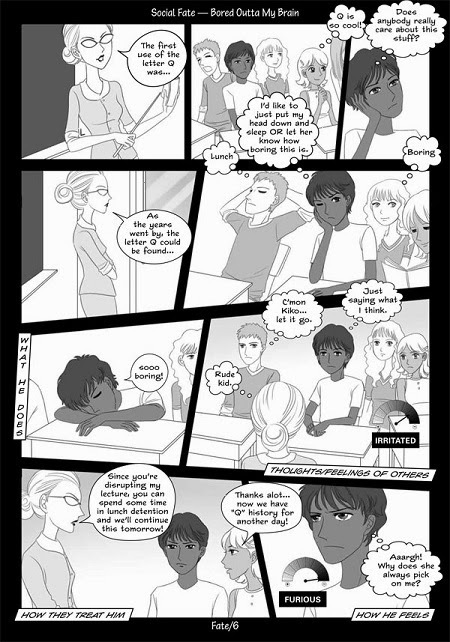 They learn when they are being bullied and no one helps them. They learn that they are "less" because they are never TAUGHT explicitly what they can do about these issues because for the most part, a lot of people learn this as they go unlike math and grammar, two things that are taught explicitly. 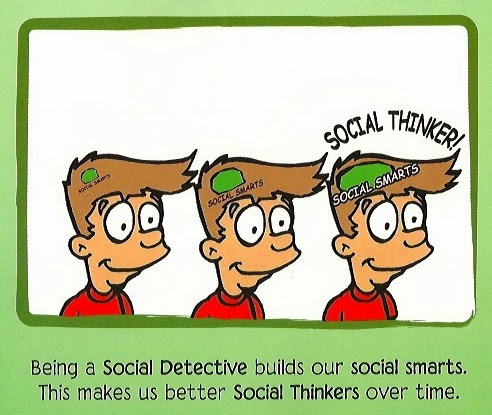 If you are curious about Social Thinking program and your child is in the young elementary grades eg. K-3, try this book out. It's for kids but it's for adults to use with them. 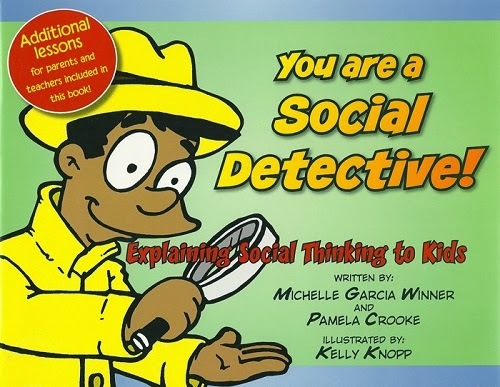 There are no teacher's notes on the side but if you have been reading my favorite social thinking book that explains the program, you will be well equipped to use this text with your kid. My tutor uses this with my kids. I believe that Social Thinking will teach my kids to not only be more socially savvy but they are going to do better in writing and answering questions if they understand how to take another's perspective. I can't stress this enough. This is a kids' book and a teaching guide too. Want to hook a middle school principal who has no time to read your "great idea"? Get him/her this book. This is a very cool book. Seriously, it's a very cool book. It's not social thinking made for tweens because they used Manga. 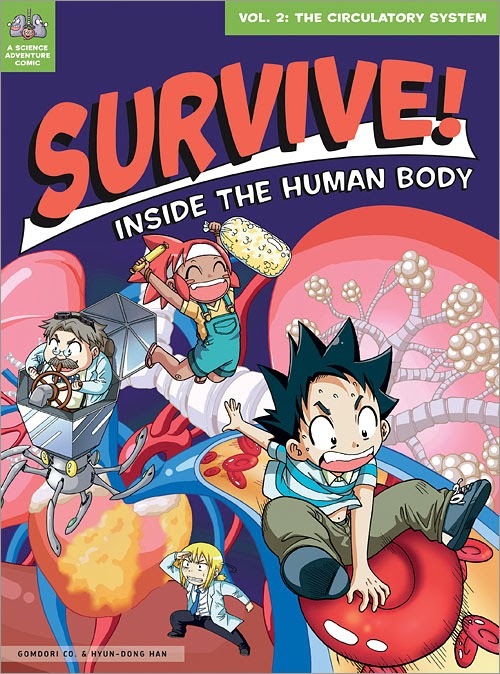 No, rather to me, it looks like Manga was a great way to illustrate what was being taught to the kids. The tone used here is very matter-of-fact-ish. One of the greatest attributes of Social Thinking is how this approach does not judge the children. They acknoweledge and validate children's natural inclination to be bored or annoyed when they are but the book shows them how outcomes are dependent on their actions and most importantly: how they feel about themselves after everything is all said and done. Nobody talks about this enough. Ie. "Who cares if you are right and she is wrong? Because you talked to her that way, now she is not only wrong but she also thinks you're a total jerk. How's that working for you?" Use my buy link at Amazon and support Toys are Tools! Cam Janssen is a gifted kid with a sick photographic memory. She is not at all humble about it either. She is a dog with a bone when she is onto to something. No one can tell her to stop. And if she is right, she is right. She will explain it to you but she is right. She always is. Does this sound like someone you know? Tester #2 LOVES Cam Janssen. He loves the way they repeat how she is introduced in every book. You don't have to start from Book 1 to get to know Cam. I think kids like characters who are kind of like them. I think #2 has an interesting visual memory but I don't know if it's photographic. Still, he is in love and has often tried to "write" his own Cam Janssen book. If you have a box load of Cam Jansen book that you want to sell. Email me! toysaretools at gmail.com I owe the library sooooo much money because this child wants to keep them forever! This family has GREAT taste in books. Thanks for the find! What a cool looking book. Very Popular on Amazon right now. $9.60, Buy from my Amazon link. I love Not A Box by Antoinette Portis- such a great little book. Not A Stick, the 2nd book by the same author, is also good. 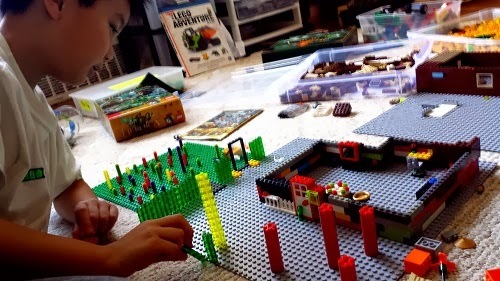 Yay for imaginative stories and open-ended play-things! A book that should be added to the list is an oldie but a goodie- "The Phantom Tollbooth" by Norton Juster. It's a true modern classic, and the protagonist learns to appreciate the scholarly subjects and concepts he once detested and found boring throughout the tale. 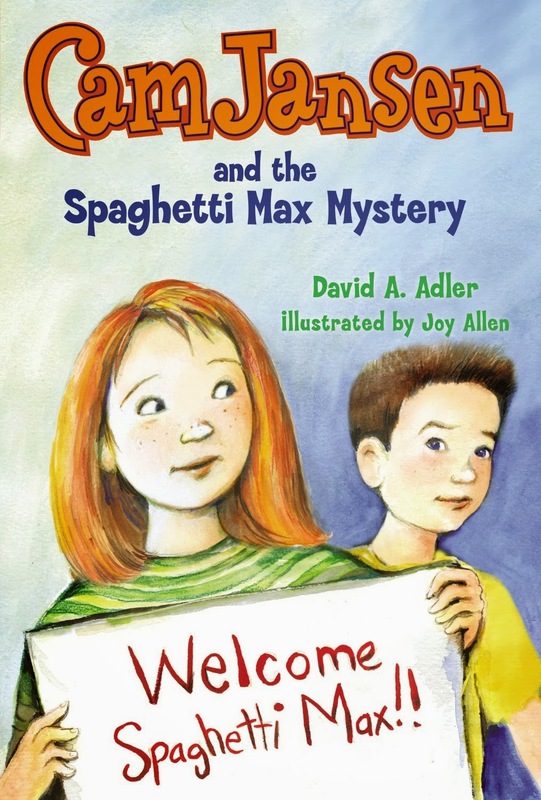 Lots of puns and wordplay- a great read-aloud chapter book that the whole family can appreciate. 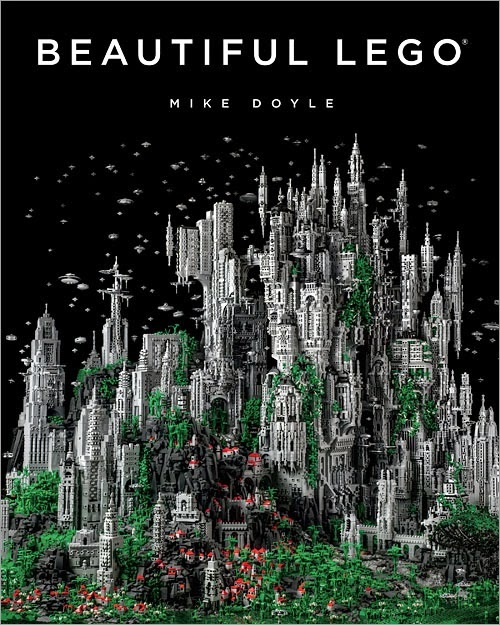 Beautiful Lego seems amazing. It gets my vote. I'm excited to check out the elements book. I just tried to request the Story of the World on CD from the library and there are 4 holds on it. I wonder if the others read your post! My son has enjoyed the Olympians series of graphic novels by George O'Connor. We haven't gotten as much from our Learning Ally account as I'd hoped. The recordings just don't compare to the ones done by authors or actors on CD. It is great when those aren't available though. SOTW is incredible! We are 3/4 way through volume 3. I agree the CDs can be costly but are wonderful! Seriously can you believe what you learn from these?! knuffle bunny would be great on this list! Thank you so much. It's on my to-read list now! I wish you could see all the pages. simply. amazing. I tried getting a copy from a seller that didn't offer prime shipping and everyday, my son kept asking me where it was. two weeks later I realized that the order was canceled and so I ordered it with prime shipping and he finally exhaled. it's a great book. Gosh, I didn't even think of going to the library. It's for the best. I have many overdue fines. oh, you love it too?????? how awesome!!! I have yet to meet anyone who knows this story. My son listened to 2,3, and 4 on Learning Ally but nothing beats Jim Weiss' narration! AWWWWW.... #2 loved that book sooooooooooooo much. 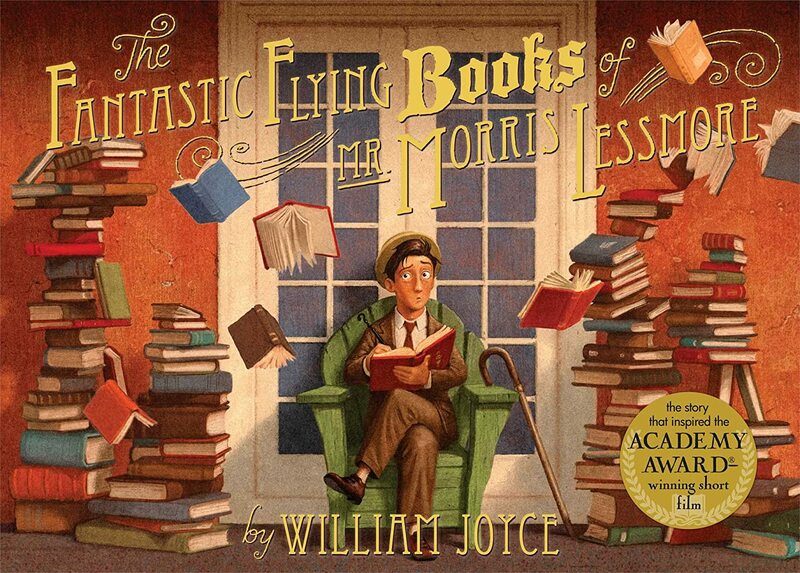 I enjoyed The Fantastic Flying Books of Morris Lessmore just as much as my boys did! 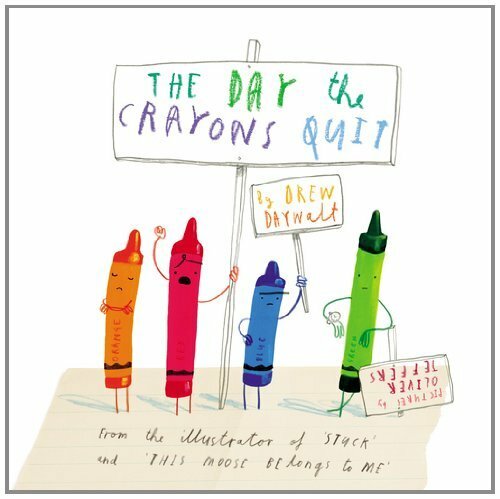 I would vote for The Day the Crayons Quit book. We are huge book fans but have not read this one yet. I have heard good things about it and it would be a perfect gift for my grandson who will turn 4 in January. For Christmas I bought my grandson the Goodnight, Goodnight Construction Site book by Sherri Duskey Rinker. 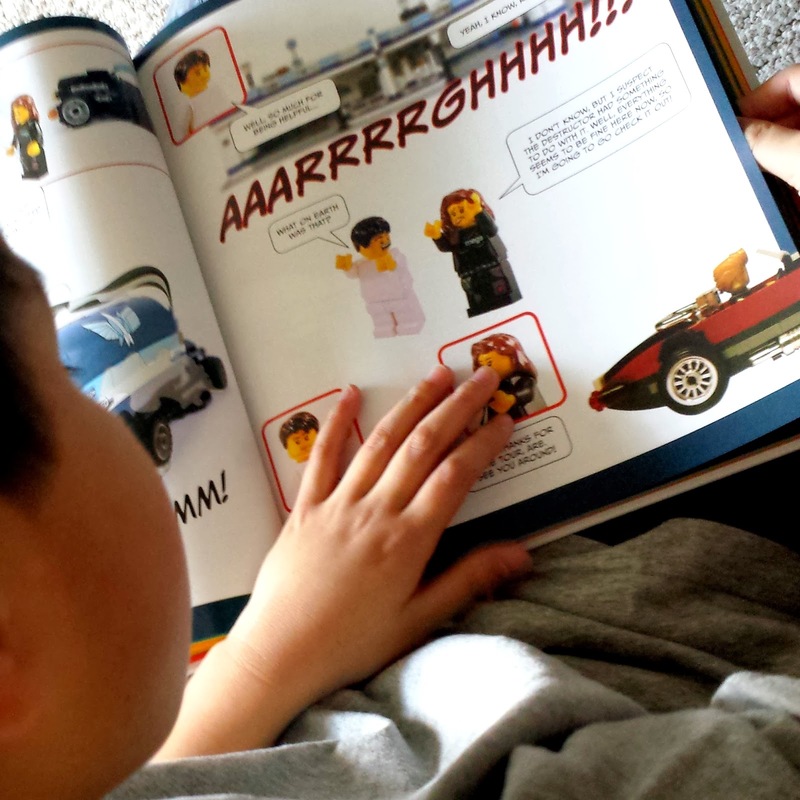 He loves construction vehicles and this is a great bedtime story! I would add this to the list.